This weeks issue: Just before the concrete pour (this is an important part of the building inspection to ensure the mesh is per the engineering drawings), I noticed the rear of the site had been cut out about 500 mm below ground level and therefore raised the front up by 500mm. Checking the site with the drawings, it was clear to me that there was no support points on the front slabs ie. no support to stop the slab from cracking. This was a mistake by all trades as they didnt follow the eningeers design and drawings, yet continued to move foward with it all. Therefore underpinning is required to fix the problem. 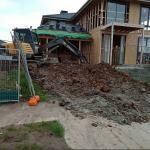 Without Build Right Consultants being on site and checking over ever stage of the build for the client, an unstable home would've been built. It's important to have somone looking out for you (the client), ensuring your home is being built to 110% standard, meeting all the building codes and are getting your moneys worth. By not only working with the trades to ensure they are following plans and understanding reports, we work with you to ensure your move into your dream home is swift and issues like this get resolved before it's too late.